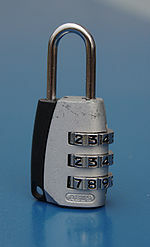 The 155 is a combination padlock made by ABUS. It features a resettable 3 or 4-digit code, with each wheel controlling a different digit of the combination. In a three digit 155, there are 1,000 (103) theoretical combinations. The ABUS 155 is primarily used in low to medium security applications where convenience is a priority. The shackle can only be opened when the correct code is dialed and this is required in order to reset the code. With the correct code dialed in the user pulls out the shackle and turns it 90 or 180 degrees (depending on model). At this point a small metal protrusion on the shackle base lines up with a hole in the lock's body which allows it to be pushed back down. With the shackle held down in this position the combination that opens the lock can be changed. The lock housing is made from a front and back part joined by two rivets visible on the back of the lock. The left side has a black inset with a fastening hole. This page has been accessed 42,460 times.